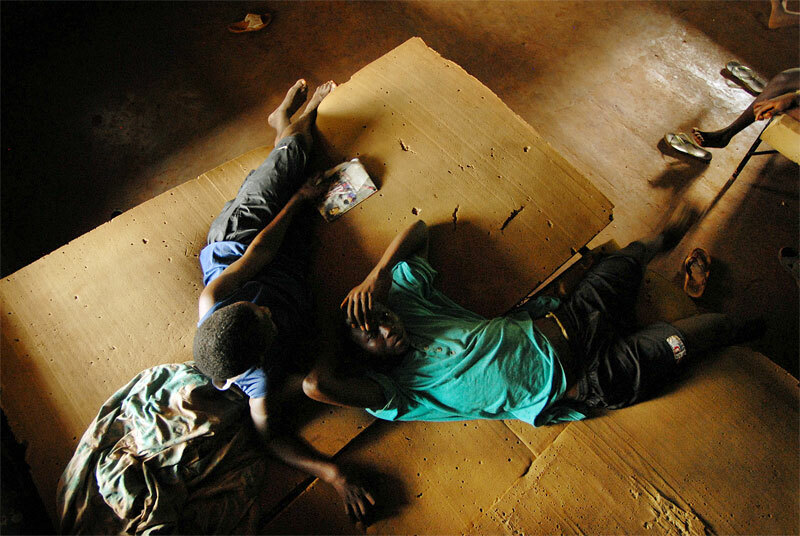 Young men convicted of petty crimes lie around on bug-infested mattresses at the approved school for convicted juveniles in Freetown, Sierra Leone, November 23, 2006. Unlike the Freetown remand home, the approved school is still undergoing rennovation, and has dire conditions and few resources for food and hygeine. Most young inmates claim they are fed only one meal a day, there are no toilet or bathing facilities, and only a few old mattresses for sleeping. Dozens of suspected juveniles are mixed with adult prisoners in prisons throughout Africa, but because of a lack of birth certificates, it is difficult for officials to ascertain who are juveniles, and who are adults.